In honor of the 100th season of Tech football, I’ve taken it upon myself to name and honor the greatest player in Tech football history. When choosing the greatest player to ever play on the flats, many come to mind. However, none of them captivated the American people and college football as Clint Castleberry did. The legend of number 19, the only jersey retired by Tech, is relatively unknown to just about all of the new generation of Jackets. Next time you’re in Bobby Dodd Stadium, look to the northeast corner of the stadium. There, you will see a concrete slab with a picture of Clint Castleberry carrying the ball. Some may know his name, but few will know his story. Castleberry grew up in Atlanta and attended Boys High School. At the time, Tech was coached by the hall-of-famer William Alexander. 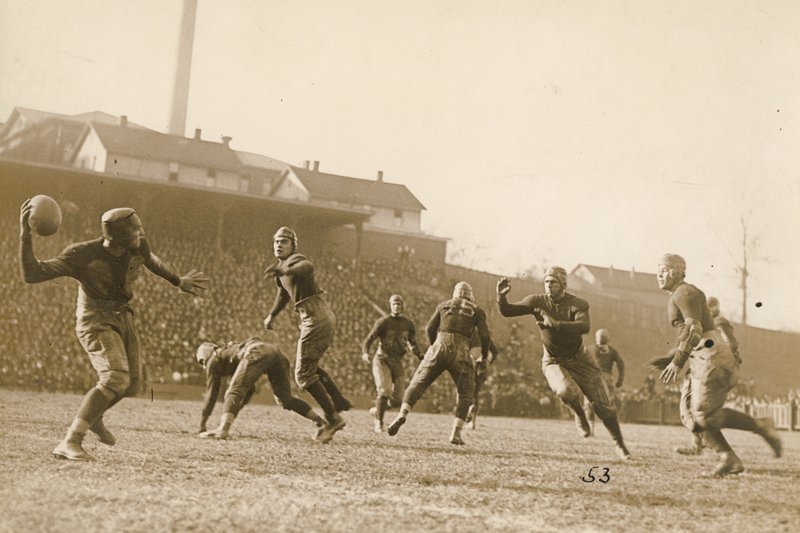 After leading Tech to a national championship in 1928, Alexander’s Tech teams struggled in the decade to follow. Leading up to 1942, Tech was a combined 6-13 and not much was expected of them in the season. However, everything changed when Castleberry decided to come play football at Tech. Castleberry was a 5-foot-9-inch, 155-pound running back. He also played quarterback and starred on special teams and defense. Notre Dame was coming off a great season and were expected to compete for the national championship. Even with the warning of Castleberry, Notre Dame was unable to stop him. Castleberry singlehandedly defeated the Fighting Irish and ran an interception 95 yards for a touchdown. Tech won 13-6. Against Alabama, Castleberry led Tech to victory. He scored the game’s only touchdown, and after the game, Alabama coach Ralph Thomas said, “[Castleberry] is the best first-year defensive back I have ever seen.” Tech entered their final game of the season 9-0 and ranked No. 2 in the country. A win would have given Tech the 1942 AP national championship, but Castleberry was hampered by knee injuries and was not at full speed. Castleberry played limited minutes in Tech’s Cotton Bowl game against Texas, and Tech lost 14-7 to finish the season 9-2. Castleberry finished the season as the leading rusher and passer for the Jackets. He was the first underclassman to be on the first All-SEC team and took third place in that year’s Heisman Trophy. After the 1942 season, Castleberry enlisted for duty in the Army Air Corps and planned to return to football after the war. On Nov. 7, 1944, Castleberry’s plane took off in Liberia, but it never landed. After a two-week search, Castleberry’s status was changed from “missing” to “killed, no body.” Castleberry gave the ultimate sacrifice. Undoubtedly, if Castleberry had finished his Tech career, he would have won multiple Heisman’s and led Tech to multiple national championships. He was Tech’s greatest football player ever in the short time he played, and he was an American hero. No freshman will ever captivate America like Clint Castleberry did.